No Reservations Needed! Posts welcome anytime! Come, Stay, and Relax! Sorry Everyone. I know I havn't done a very good job with keeping up with this thing, and I know some of you are interested in whats going on up here. Well lets see, we had a great time at Christmas getting to go home and see family although our flight down wasn't so great, bad turbulence and looonnnggg waits. No Fun. Dad & Mom drove us back up to Virginia so they could see what the area was like. We got to take a detour through Gatlinburg, TN, which was fun its really nice in that area. Amanda is still enjoying her job, keeps her quite busy at times but really likes the people she works with. I'm still playing on the praise team at church, and learning alot from that as well. Oh yeah, some of you know, but we also right after Thanksgiving bought a new car :) it's a 2009 Scion Xb in Stringray Metallic Blue. Its nice, I will try and post a picture of it. We have had some snow up here, not a whole lot but enough. Yesterday and today was all ice, it's weird seeing all the tress and plants white but not with snow, just solid ice. Well I need to run to class, we are gonna try our best to keep up with this thing. Sorry It's been so long since we have posted. Been told people actually read this thing! haha! Well to give everyone updates, here we go. Amanda is settling into her new job. She is really enjoying so it far. Things haven't gotten to busy for her just yet, but they will.Students will be back soon, so that means bring on the chaos. They had an intensive a couple of weeks ago. And for those of you who don't know what an intensive is, it's pretty crazy. Its a whole semester of work crammed into 1 week!!!! It's for MA and DR.
Well Freshmen Orientation starts on the 13th. Its getting very close. Can't believe it's August already. This semester I will 11 hours, well I will have 12 once I start guitar lessons. But I don't know if I will start this semester or not. I was able to get all my books for under $250.oo so we were real happy bout that. I am getting excited/nervous about classes starting. Looking forward to it, ready for them to start. Oh and for those of you who didn't know, I got to lead worship on the 20th and 27th of July at Pastor John's church. He was out of town and asked me to fill in. And to me for Him to ask me to lead was a big compliment and honor. If you ever heard Pastor John play piano, sing and lead worship, you know He is very talented. It was alot of fun, and it was a great experience and I think it went really well. I was very thankful God gave that opportunity to me. He has even asked us to join the praise team if we felt if it is where God wanted us to serve. I know I would enjoy playing with them and I know Amanda would enjoy doing the slides and running sound. So we are praying to see where God wants Amanda and I to serve. Well Nanny and Uncle Don came to visit a couple of weeks ago. It was really nice to have family in town. We enjoyed their company, and we got to see some really cool things while they were here. There is alot of history in this area, so we went to some of the historical sites. Everyone is welcome to come visit us anytime! Just not all at one time :) Our little apartment can only handle so much! Well I will be signing off for now, will try to update this more often. Please continue to pray for Amanda and I, we appreciate ya'lls prayer and support VERY MUCH! Well Amanda will be back soon from her mission trip. She went to Austin, TX with the youth group in Texas we were involved with. She's almost been gone for 2 weeks, and I've been going a little stir crazy with her not here, but I know she's having fun. Classes start August 18th for me, but I think orientation is the week before that. I've got my classes registered. Taking 3 music classes, english, and gen ed which is a bible class. I got asked to lead worship on the last Sunday of July at the church we are going to right now. We are friends there with the music pastor, and he was gonna be out of town a couple of Sundays so he asked if I could fill in on one Sunday. It will be nice playing again, havn't played too much since we've moved, yeah I know shame on me lol. Well there is a small update of what is going on here. We still aren't totally unpacked yet, still have a few boxes around. But we will get it done, we are having my aunt and uncle visit next month so we want to have everything done. Just please keep us in your prayers. Amanda starts her job when she gets back, and I'm still on the hunt for a job. Thanks! We made it here to Virginia safe and sound, but not without our adventures. If you ever decide to move, promise you won't use Budget truck. We had a lot of problems with them and they weren't very helpful. But anyway... We are settling in our new place, and starting to get familiar with the area. It's funny people are saying its soo hot, it is in the low 90's but like no humidity. So we are just like, man this feels nice! The mountains are real pretty in the background, we are still not use to seeing that. It's crazy! Thanks to those who have been praying for us during our journey! We are moving June 1, 2008! OK let me give a little background. For those of you who didn't know. Amanda and I have been living in Nacogdoches, TX, also know as Nac-a-nowhere. For the last couple of years, I've been here for 4 1/2 years and Amanda has been here since we've been married so 2 1/2 years. Anyways. I moved up here to help out a church with the music on Sunday mornings and to help with the Youth and play music for them as well. Amanda has jumped in and helped with the Youth too, and also been helping with running the sound and power point on Sunday mornings. So there is some history for you. 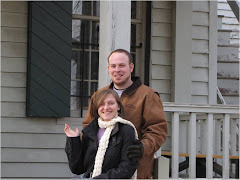 Now to tell you about us moving again, this time to Lynchburg, Virginia. I am going to go to school, Liberty University. I am going for a Bachelor's in Arts & Sciences in Worship. Pretty much getting a degree for leading worship at a church. I've really enjoyed helping/leading music at this church we were at, and God has really just opened a door for us to go to school. The Pastor who married us is teaching in the music/worship department at Liberty, and he has really helped us out. We went and visited the school last month, and wow very big. It was gorgeous area, real pretty campus, mountains in the background and everything. But we were most impressed with the Center of Worship department. They were just this very close and very focused group, which was very encouraging for us. We are both really excited about the move, it is a bit stressful but moving always is. We plan on being there for a while, since I haven't been in school for like 8 years, I am going to be taking things slow to start off with. We have already found a place to live, this nice little one bedroom apartment, but we are still looking for jobs. Really trying to get one at the University, because when you do, you get free schooling. We just ask for your prayers as we move and look for jobs. We know that God is going to take care of us, and we are excited to see how He is going to work things out. Hey All,Amanda and I are new at this whole blog thing. So we are trying it out. So don't be surprised if there is not alot on here right away. We wanted to be able to keep in touch with some people, so please feel free to comment. We will do our best to post back, I'm sure we will catch onto this and be posting like crazy!! !